remember finding myself going to the store several times a week to buy those white chocolate bars but I had to kick that habit because it's not good to eat so much candy. When I heard that Hershey's came out with a Cookies 'n Crème cereal I knew this cereal had to be good! I didn't care if it is full of sugar or not, just another way to get me back to eating one of my favorite candies but instead in cereal form. I first let my kids try it out since they were dying to taste it and they didn't like it at all. I tried it out myself with my rice milk and I don't like it as well. It doesn't taste anything like the candy bar and taste very artificial! The shapes of the cereal reminds me of Coco Puff's but that cereal taste a whole lot better than the Cookies 'n Crème cereal. I was really hoping I would enjoy this and I'm highly disappointed! Hershey's missed the mark on this one. Is Hershey's Cookies 'n Crème Cereal Worth a Try? I won't be buying this cereal again. The taste is bad and now the cereal is sitting on top of my refrigerator not being eaten because no one in my household likes it. Soon it'll be in the trash. 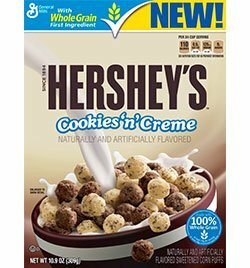 So to all the Hershey's Cookies 'n Crème lovers out there, save yourself from disappointment and bypass this cereal and just eat the candy bar instead.